It’s 1973 all over again as the Third Doctor and Jo Grant return once again for a brand new double-bill of adventures. In this third volume, the pair have their work cut out for them – not only dealing with yet another Earth invasion but also finding themselves on a world subjugated by the Doctor’s deadliest enemy. Even though we’re now three volumes into these new Third Doctor Adventures, there are still bound to be many out there sceptical of the decision to recast Jon Pertwee. To be honest, if you want to listen to Third Doctor-based stories (and you’d be mad not to. He was a wonderful Doctor), you don’t have much choice than to listen to another interpretation, unless Big Finish decide to call in Derek Acorah and ask him to channel the great man himself, of course. But panic not. The further one proceeds into these stories the more it becomes clear that Big Finish have definitely found the best man for the job. Tim Treloar captures Pertwee’s almost imperceptible lisp, his sibilance and his speech patterns and mannerisms pretty much perfectly. I’m a big fan. Can you tell? So Third Doctor impersonation = good. Jo Grant = always awesome. But what of the stories? Kicking this latest set off is a direct sequel to the classic Planet of the Daleks, comfortably opening the doors for future adventures to be set between its conclusion and Jo’s subsequent departure in The Green Death. Directly following a Dalek story with another one means that the episode has plenty of call-backs to Planet, and as well a few other references to other prominent parts of Dalek history – particularly a clever twist on the Robomen from The Dalek Invasion of Earth. 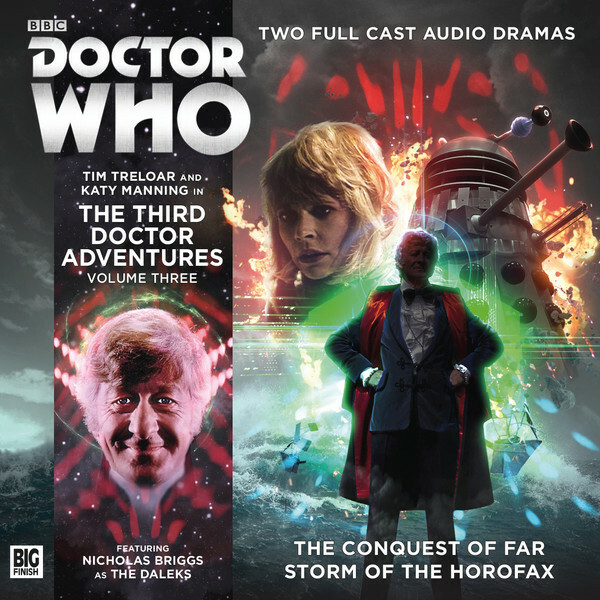 The Conquest of Far is a classic Dalek story through and through – no big schemes, no clever traps for the Doctor, just a good old fashioned invasion story where the Doctor and Jo just have to put a stop to the Dalek’s plans. The Doctor and the Daleks aren’t the only ones that spend some time apart either – this story makes the bold move to split the Doctor and Jo up for most of its runtime, giving each character a chance to shine on their own in two separately running plot lines. This really works to both characters’ benefit, as not only does it give Katy Manning the opportunity to take charge but also lets Treloar show off his take on Pertwee without having Jo there as an anchor. Meanwhile, The Storm of Horofax takes the action back to where this particular TARDIS duo are always the most comfortable – 1970s Earth (or maybe it was the 80s? There’s been an argument about this among more…erm…passionate Whovians since Lord knows when. I don’t give a rat’s arse, quite frankly). As such it doesn’t take very long without the story to find its footing and once again both characters are in top form. It’s another big spotlight piece for Manning, who gets a lot of great dialogue with Arianda, the Horofax Provost played fantastically by Robin Weaver. The story plays heavily on the concept of time, doing a lot of interesting ‘timey-wimey’ stuff, but never making the story too difficult to follow as a result. It’s an adventure with lots of interesting twists and turns, building the Arianda and the Horofax army up as a very credible threat. Volume three delivers another pair of fantastic adventures, with the dynamic between Treloar and Manning continuing to develop and blossom in the same way Jo Grant and the Third Doctor’s did all those years ago. A Big Finish Dalek story is always fun, while Storm of the Horofax adds another memorable villain to the franchise’s ever growing roster. The Third Doctor’s legacy lives on in wonderful fashion, and the memory of Jon Pertwee couldn’t be more alive. And Big Finish certainly knows how to conjure an era. These stories certainly feel authentic, the guest performances are sharp, there’s a depth to the ideas on show, and they just feel right. Katy Manning needs her share of the credit here too, for once again enthusiastically inhabiting a character she’s been playing for decades.